Capital flows pouring out of China have been well documented. It’s been estimated over 1.2 trillion dollars has flowed out of China since August 2015. Meanwhile, National Bank has estimated 12 billion dollars was invested from China directly into Vancouver real estate back in 2015. However, recent tightening of capital outflows shows foreign investment on real estate is slowing. In a recent report from Petra Blazkova, Senior Director of Asia Pacific Analytics at RCA, says China’s outbound real estate investments dropped by 19% year-on-year, to $5.8 billion, in the first quarter of 2017. 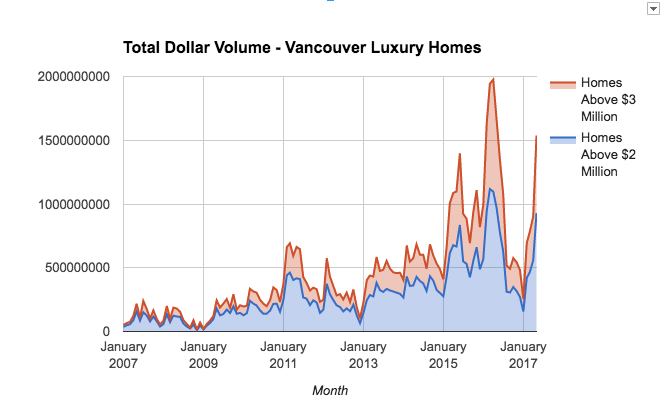 The slowdown appears to be showing up in the total dollar volume for luxury homes in Vancouver. In the graph below, the total dollars spent on Vancouver homes above $2 million has dropped 5%, while total dollars spent on homes above $3 million dropped 12%. Total Dollar Volume on Luxury homes in Vancouver.